No matter what your circumstances- own or rent, sun or no sun, extra cash or not- there is a way you can use renewable energy for your electricity. Typically people see the most benefit from on-site solar (most tax benefits), then community solar (some tax benefits), then ESCOs (no tax benefits). We hope everyone will take advantage of one of the options below. Buy or lease solar panels to put on your home or property. This is the best option if your site allows and you have money to invest. You will save the most money doing this. Buy or lease solar panels from a solar farm/community solar. This is a good option if your home does not have enough sun exposure, or you do not want the panels on your home. Contract with an ESCO (Electric Supply Company) to supply renewable energy to your utility in your name. This is a good option if you cannot install solar panels at your home, there is no community solar available to you, you do not have money to invest and/or do not want to borrow money. The following three local companies are recommended by Solarize Albany and can come to your home to evaluate if you have enough sunlight and give you an estimate as to cost. They can also describe any tax credits or rebates that are available. info@apexsolarpower.com Ownership model. Financing options available. More than a million homes have already gone solar in the U.S., and many more homeowners are considering installing solar. If you’re in the market for solar, you probably want to know what actually happens during a solar panel installation. 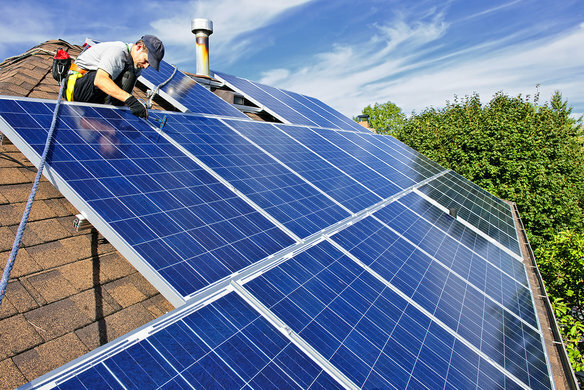 There are five big steps that need to happen after you sign your solar contract before the solar panels on your roof can actually power your home, and a lot of it is behind the scenes. To show you what you can expect, we’ve outlined a simple five-step guide for the typical solar installation process.It’s always good to start with a broad overview. Start out by watching this time-lapse video, Solar Installation in Less Than a Minute, which shows the assembly of a 6.7 kW solar energy system on a home in Newton, Massachusetts. The happy homeowners now save $2,250 on their electricity bills every year thanks to their new solar panels, and will break even on their investment in just five years. How Much Do Solar Panels Cost in the U.S. in 2017? In 2017, most homeowners are paying between $2.87 and $3.85 per watt to install solar, and the average gross cost of solar panels before tax credits is $16,800. Using the U.S, average for system size at 5 kW (5000 watts), solar panel cost will range from $10,045 to $13,475 (after tax credits). That’s nine percent lower than it was a year ago, and solar panel system costs are continuing to fall. However, to really understand what a single solar panel will cost and what a complete solar system will cost, it’s important to compare prices quoted to homeowners in your area – total costs can vary depending on the state that you live in. “Solar power will soon be an option for anyone with an electric bill. You don’t need to be a property owner or even have a rooftop to subscribe to a Community Solar project. You just need to have an electric bill, and a desire to save.” So states a new flyer from the New York State Energy Research and Development Authority (NYSERDA).So how exactly will this work? Most community solar arrays (“CSAs”) will be larger ground-mounted solar systems, located in a sunny spot near utility lines and screened from view. Electricity generated by the CSA goes into the utility company’s grid every day. The utility will meter the energy generated every month, and apply credits directly to the utility bills of customers participating in the CSA. For example, if a CSA has 1,000 solar panels in total and you own 10 of them, you get 1% of the energy generated by the CSA credited to your utility bill every month. 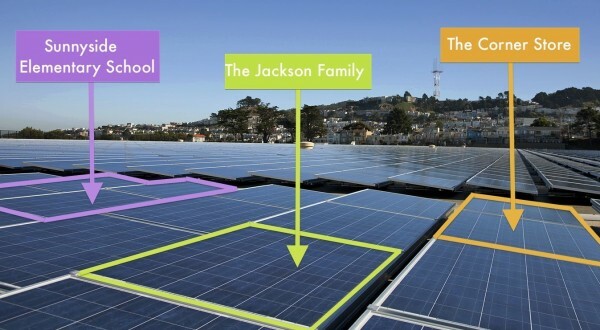 The effect is essentially the same as if those 10 solar panels were on your roof, unshaded and facing south. Under the CSA ownership model, customers can purchase a minimum of 3 solar panels in the CSA, or as many as they want or need, up to the quantity necessary to offset 100% of their demonstrated annual electricity usage. Customers who move will be able to take the monthly bill credits with them to their new home or apartment. They can also sell the panels, give them to family or friends, or donate them to a charity if they move out of their utility’s service territory. New York State set up this program so everyone could save on their electric bills. So the next question is, how much could someone save with community solar? Looking at it one way, a residential electric customer could do nothing and just pay the utility $25,000 for electricity over the next 25 years. Or they could invest about $10,000 in solar panels in a CSA and spend next to nothing on electricity. Presently available for National Grid customers. Monolith Solar, 444 Washington St, Rensselaer, NY 12144, sales@monolithsolar.com, (518) 444-2044, monolithsolar.com/gosolar Currently on line and selling panels. Offering ownership and PPA (Power Purchase Agreement: 10% discount on current electric bill) models. Hudson Solar at CSA@hudsonsolar.com http://hudsonsolar.com/, (866) 452-7652, Currently on line- in Clermont, NY- . Ownership model. Financing options. Almost full. Currently seeking other host sites. Wynantskill, NY 12198, highpeakssolar.com. Building a solar farm in Brunswick. Taking applications. Two options: PPA, Power Purchase Agreement- Paid monthly for 5 years. 20% less than National Grid. Pay once for 20 years. Customer does not get the tax credits. 9/2018 projected on line. Hudson Solar will explain the different sections of an electric bill to help you understand what portions of your bill can be eliminated by going solar. Presented by Alan Waters, Garrett Lee, and Greta Noble from Hudson Solar. Presentation will take place in the Stedman Room of the library. In New York you have the option to purchase renewable electricity, either directly from your power supplier, or from an independent clean power generator. Some power companies provide an optional service, called green pricing, that allows customers to pay a small premium in exchange for electricity generated from clean, renewable (“green”) energy sources. The premium covers the increased costs incurred by the power provider (i.e., electric utility) when adding renewable energy to its power generation mix. In some parts of the country, you can choose not only how your electricity is generated, but also who generates it. Just as the long-distance telephone industry was restructured, certain states have restructured their electricity industry in order to allow competition among electricity generators. In some of these states, clean power generators, who specialize in producing electricity using renewable sources, are taking advantage of the restructured market to sell clean power products to residential, commercial, and wholesale customers. Some default suppliers are also teaming with these competitive marketers to offer more green power options. Initially efforts to sell clean power were aimed at consumers who would choose to pay slightly more for renewable energy products and services that reflect their environmental values. The small premium they pay offsets the additional costs power companies incur in purchasing and/or generating electricity from renewable sources. Today some companies offer competitive pricing to your electric utility. There are many Electric Supply Companies (ESCOs). Look for ones that offer all renewable energy, that have a fixed rate and that have no cancellation fees. Look carefully at the offers. And check the price on an annual schedule. Some companies start you at a low rate and then raise the rate in a way that most of us don’t see. Here are three I’ve heard good things about. Clean Choice– a little more expensive, but the company deals only with renewables. Green Mountain Energy– a little less expensive. They are a renewable division of a larger fossil fuel company.